Some may think digital is slowly killing television. But when you take a close look at numbers and charts, the conclusion might be very surprising. Learn more in this in-depth analysis. Among the main traditional media channels like print, television, radio and OOH, TV seems to have been the least affected or concerned by the expansion of digital advertising budgets. Top brands are still devoting a large share of their budgets to television ads. Nonetheless, that reality is changing fast, and there are a number of reasons why. For one, as many of you may already know, 2017 was the first year in history when digital ads beat TV in terms of media spend among marketers. As it happens, eMarketer predicted exactly this back in 2016. But keep in mind, the numbers above can be deceiving without proper context and a more comprehensive analysis. Any digital marketer who expects to see clients start moving dollars from TV spots to 300×250 desktop banners has another thing coming. As you are about to see, this is far from the case. The above assumption is actually a misreading of the current trends. What’s really happening, is that television is going through its own digital transformation. In truth, a significant portion of the dollars we see moving from TV to digital are actually traditional TV dollars being converted into digital TV or digital video in general. The same transformation is taking place with traditional radio and OOH slowly morphing into the digital stream. Digital marketers and media agencies need to be aware of this transformation and embrace it in order to maximize its full potential. From apps to OTT to mobile devices, new advances in technology and content delivery have blurred the delineation between TV and digital video. TV is beginning to embrace and gain access to what has traditionally made digital so powerful – the application of precise data segmenting and measurement. TV buyers can now apply massive data sets to their strategy, understanding much more about a consumer than the traditional “age and gender” demographics. In Canada, 2018 seems like the year for large networks like Rogers, Corus, Bell and Videotron to start rolling out a more serious Data Enabled TV (DETV) offering in the market. This model has falsely been labeled by some as programmatic. In fact, for now, there is nothing truly programmatic about DETV, at least not on the advertiser side. The inventory is not in real time, and there are neither bid engines nor bid requests in the buying process. What characterizes DETV is simply the possibility of targeting your TV ads with much more advanced audience segmentation. For example, instead of only buying your GRPs in terms of demographic, age and geographic data pulled from well-established traditional sources like Numeris, we can now add interest, behavior patterns, purchase intent, etc. This also opens new possibilities for advertisers to sync their first-party audience data with DETV networks through their DMP. In essence, the way it works is that TV inventory from players like Rogers is now integrated with video ad tech infrastructures like Videology. This integration allows us to connect the television ad with new data sources like third-party data vendors or Rogers/Bell/Videotron’s own first-party data, which can be combined across devices to map out what an audience segment ‘really’ watches on TV. Given the huge amount of data in the hands of telecommunications companies, the potential targeting capabilities of this channel should not be taken lightly by marketers. As such, your TV media plan may end up having less ‘Prime’ inventory. However, the upshot is that now you can target a much more specific audience, i.e. Fashionistas, Entrepreneurs, Travel enthusiasts, etc. This is all very similar to what happened with display about a decade ago. Back then, we targeted every user on contextually relevant websites. For example, Air Canada served ads on TripAdvisor. Now, display is audience-driven and we target specific users in whatever brand-safe environments we find them. Today, TV is undergoing a very similar transformation, with all the attention power that comes with this multi-billion dollar channel. Exciting! As TV viewership shifts online to over-the-top services and connected devices, audience measurement models need to evolve. In our latest Evolution of TV article, we explore how combining TV panel-based ratings with digital census-based data will enable marketers to understand an ad’s effectiveness in detail. 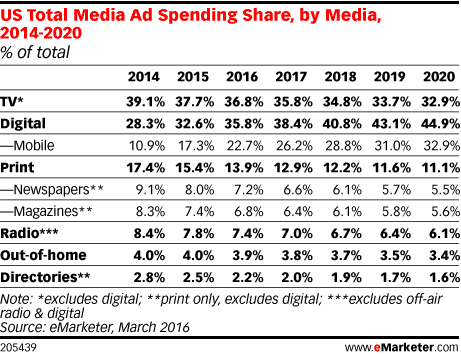 As mentioned earlier, the eMarketer table shown above needs more context, particularly considering the little asterisk (*) next to the TV numbers that states: ‘excludes all digital.’ This is a significant disclaimer to address in our analysis. Basically, the numbers we see in the table only speak of traditional, non-addressable TV, in other words, non-digital TV. On the other hand, digital’s rising statistics do include video and by extension digital forms of TV, namely Connected TV, DETV, Programmatic TV and addressable TV (which is rising rapidly as a digital video format – you can read more about it in Google’s article). The key takeaway is this: TV consumption is increasingly becoming a digital video experience. TV can now be experienced across multiple devices, and between now and 2020, mobile ad investments will, in large part, come to include digital video. As Netflix bingers well know, you can start watching a show at home on your TV set and continue watching later on your phone, picking up where you left off when you were on your living room couch. With multiple streaming apps like TubiTV, Crackle and Popcorn Time giving users free alternatives to Netflix in exchange for TV ads, more potential advertising dollars can move to cross-screen television campaigns. We also know that Amazon is looking to get a slice of the ad pie with a free ad-supported version of its Prime Video platform to rival Netflix, as well as having bought Hulu as an added step to grab market share. Facebook is the other sleeping video giant making aggressive moves to get in the TV game. The budding Facebook Watch project is looking to reinvent the way users consume television with a slate of new interactive shows. Facebook is also introducing methods of crossing its data with TV campaign performance to measure the combined effect. This analysis can now merge TV with social media and add social engagement metrics to the performance of TV campaigns. Instagram, on the other hand, just launched IGTV for long-format video, which will further increase the app’s share of video views. Snapchat, too, is claiming a spot as a video content series creator, recently announcing the expansion of its original programming with a docu-drama series from Bunim-Murray Productions. Snapchat further announced it will be democratizing the creation of its Snapchat Shows to social content creators and not just to large network players like NBC. Of course, we can’t forget about YouTube, the biggest digital video player in the room. Every year the YouTube television app grows in popularity in households and living rooms around the world. In addition, YouTube is as big on mobile as Facebook is, providing a very smooth cross-device experience for users. YouTube has been gaining immense popularity over the past year. The platform caters to the new trend of users watching mobile and short-form video, while connecting with the TV audience as well. Much of the video content where ads are shown will be produced for social media (yes, YouTube is a social network). Many of the video ads displayed within social content are created by regular social media users. Much of that content will be socially shared and consumed on mobile devices as well as TV sets. 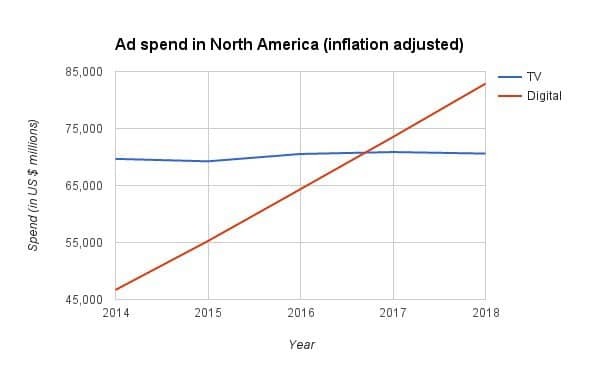 In light of all the above, when we benchmark the eMarketer chart against the Zenith/Magna research, we can see how mobile digital advertising will eat away at desktop digital advertising, much more than TV. Based on the above figures, most of the growth is in mobile. But what is interesting to note is that TV is the second highest-growing channel in $$ (millions) from 2016-2019. Humble yet stable growth is also seen for outdoor, radio and even cinema. The channels getting hurt the most by the rise of mobile in terms of linear growth (this is not the same as proportional growth) are digital desktop ads, newspapers and magazines. In fact, desktop is taking the biggest hit. And… it’s digital. In linear and insular terms, TV maintains overall stability of dollars in relation to itself over time. As mentioned earlier, it even gains dollars relative to itself over time. The blind spot in the above chart is the ratio of digital spend that will actually go toward TV or TV-like channels like streaming apps, DETV, addressable, set top boxes, etc. When we look at things from that perspective and aggregate all the numbers of digital and traditional, television may in fact become bigger than it ever was, thanks in large part to mobile. Digital advertisers who look down on traditional television do so at the risk of throwing out the baby with the bathwater. Instead, digital media should embrace the new face of television as it is poised to become one of the most, if not the most, important digital channel transformations to occur since the rise of programmatic banner ads nearly a decade ago. Are you ready for it? Specialized in paid search, in organic SEO, and in strategic planning, Roger is able create custom solutions that will fulfill his clients' expectations in complex and competitive environments. Roger is able to understand the stakes specific to each industry in order to suggest innovative and efficient strategies in digital marketing.